Condylar and incisor trajectories are often used for the study of mandibular movements. Condylar trajectories, however, depend on the location of the reference point and can be interpreted erroneousiy. In contrast, the helical axis analysis yields an unequivocal description of rigid body kinematics. The finite helical axis (FHA) is a mathematical model which can be used to describe comprehensively the movements of the rigid body.an optoelectronic jaw tracking system, JAWS 3D, was usedfor this purpose The finite helical axis were never localized within the condyle and often were located outside the mandible. The analysis of the FHA pathways yields more information on whole mandibular movements than simply the movements of a single condylar point. Distal Extension Bases-Removable Partial Dentures were considered one of the best treatment options to restore missing posterior teeth in upper and lower jaws. Recently, this kind of treatment has begun to disappear gradually due to the appearance of dental implant world. In this paper I'm going to review some important aspects for the success of such treatment. Occlusion as a subject, particularly as it relates to joint function, needs proper attention. Occlusion and its considerations vary in different types of prothesis likre fixed partial denture, removable partial denture, complete denture and imlant. For each of the above types, the journey towards achieving occulsion varies at each step from diagnostic stage to interocclusal records to material and occlusal morphology of the teeth. The above distinctions are not very clear and often confusing. 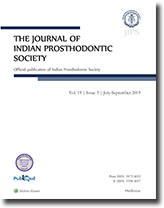 This article is a review of all the factors considered for establishing occlusion in different types of prosthesis and a comparison at each step to emphasize their significance. For many years, metal posts were used extensively for restoration of endodontically treated teeth. Their popularity is, however, declining now and there is a widespread interest in the use of non-metallic post material and techniques. Growing interest in esthetic dental restorations and adhesion dentistry has driven both manufacturers and dentists to create some innovative new post material like fiber reinforced composite and ceramics. This article provides a brief overview of recent advances in endodontic post material that have had a significant impact on the art and science of endodontic post placement. Limited mouth opening complicates treatment and compromises on it. Dealing with these patients is a challenging situation. Majority of these patients can be treated with exercise and stretching movements before impressions are made. Some do not respond to these procedures because of facial scarring and surgical manipulation of facial muscles. Modification of the technique as per the need of situation is the key to a successful impression procedure. This article describes techniques for fabrication of different types of sectional tray designs for both stock as well as custom tray, from various tray materials, to make preliminary and final impressions for such patients. In sectional tray system, the two halves are inserted independently, removed separately, and reassembled extra orally to make the cast as per the case demand for ease of procedure and comfort of the patient. Purpose of Study: To evaluate and compare the effects of two denture cleansers on surface roughness and softness of two autopolymerizing soft denture relining material. Materials and Methods: Sixty specimens of PMMA denture base material were relmed with acrylic (Coe-Soft) and silicone relining material (Ufigel-P). These specimens were immersed in cleansers (Clinsodent httydent) and water for eight hours at room temperature. For the remaining 16 hours they were stored in artificial saliva at 37°C for 60 days. Readings for surface roughness and softness were taken at the end of day 1, 15, 30 and 60 and statisticallv analyzed usmg ?t test and ANOVA. Results: Surface roughness of both the test and control groups of acrylic relining material increased with time. For the same treatment protocol, no significant difference was seen within and between the silicone liner groups. Softness of both test and control groups of acrylic lining material decreased with time. Slight decrease in softness was seen tn ali the silicone liner groups. Acrylic relining material exhibited more changes in surface roughness and softness than silicone relining material at ali time intervals. Conclusion: Withrn the limitations of this in vitro study, specimens immersed in the powder form of cleansers showed more changes in surface roughness and softness than the tablet form. These changes were more with acrylic relining material than silicone relining material. Objective: The purpose of this study is to evaluate and compare the tensile bond strength of GC Universal paint-on adhesive and the adhesive supplied by the rnanufacturer using vinyl polysiloxane impression materials (medium body and heavy body) with autopolymerizing acrylic (PMMA) custom tray material. Material and Methods: A total of 120 custom tray resin and poly vinyl chloride specimens were fabricated. Effectiveness of universal tray adhesive was compared with the manufacturad tray adhesive using the two viscosities of two brands of vinyl polysiloxane impression materials and tested. For tensile strength testing, different viscosities of the brands were dispensed in the cylinders attached to the custom tray specimen coated by the universal and rnanufacturer supplied tray adhesive. Each of these specimens was then subjected to tensile load in Lioyd's Universal Testing Machine. Data obtained was statistically analyzed. Results: Analysis of tensile bond strength revealed that the universal tray adhesive showed better strength and was statistically significant when compared to the rnanufacturer supplied tray adhesive. The tensile bond strength test revealed statistically significant difference between the two brands of vinyl polysiloxane. Conclusion: Within the limitations of this in vitro study, the universal tray adhesive is more effective than the rnanufacturer supplied tray adhesives. Statement of Problem: Difficulty in accurate location of occlusal piane due to individuai variability and uncertainty of landmarks among edentulous subjects. Purpose: To establish the reliability of certain intraoral anatomical landmarks in establishing the occlusal piane in edentulous subjects. Materials and Methods: Samples of 75 edentulous subjects of both the sexes were selected randomly. A vestibular impression to record the corner of the mouth and buccinator groove was made in 25 subjects. In 50 subjects, parotid papilla and retromolar pad were located and the relation of both the landmarks was recorded to the established ala-tragus piane. Results: Analysis showed the consistency of occlusal piane established from the corner of the mouth through the buccinator groove using a vestibular impression method. The retro molar pad also showed a consistent relation with the occlusal piane. However, the parotid papilla showed a variable relation with the occlusal piane. Conclusion: Corner of the mouth, buccinator groove and retro molar pad are reliable guides in accurate location of the occlusal piane in edentulous subjects whereas parotid papilla can only be used as an adjunctive aid in the determination of occlusal plane. Aim: This study tries to determine the righi technique for an accurate impression of post space in all dimensions. Materials and Methods: Five freshly extracted maxillary centrai incisore are embedded in a plaster block. The post space is prepared up to five number peeso reamer leaving four-mm gutta-percha at the apex. Then we use light and medium polyvinylsiloxane; five different techniques to impress post space with and without 24-gauge anesthetic needle vent and 26-gauge reinforcement wire. In all techniques except the one which uses lentulo spirai disposable tips are used to express light polyvinylsiloxane impression material into post space. Result: We evaluate 125 samples, 25 from each technique, for the presence of voids and completeness of impressions using a magnifying lens of three-and-a-half magnification. Impression techniques produce void-free and complete impressions when anesthetic needle vent and reinforcement wires are used. The technique which uses lentulo spirai to express impression material into the post space produces complete impressions. However, as there is no provision for escape of air at the time of impression material injection into the post space, voids incorporated into the impressions produced inaccurate impressions. Conclusion: Use of anesthetic needle vent and reinforcement wire is recommended to produce accurate and void-free impressions of post space while use of lentulo spirals to express impression material into the post space is not recommended. Designing a unilateral distal extension removabie partial denture (RPD) is often challenging for a clinician. Often, the use of conventional RPD design techniques results in a prosthesis that both the dentist and patient consider a failure. The two main difficulties encountered are (i) to obtain suitable retention on the dentulous side of arch (ii)stability of the denture to horizontal and vertical displacement. This artide reviews the designing options for unilateral distal extension cases taking into consideration various forces acting on the denture and the means to control the same. Patients with lagophthalmos (inability to dose eyelid) are at risk of severe eye complication due to corneal exposure. Various treatment modalities can be used to restore function and esthetics. Among all, custom gold lid implant is an effettive method of treatment with little morbidity and better patient compliance. The prosthodontist functions as an integral part of the treatment team to achieve the most functional and esthetic result. Partial maxillectomy defect presents a considerable reconstructive challenge for the prosthodontist. It results in devastatine effects on cosmetic, functional and psychological aspects of the patient. The factors which determine the prognosis of prosthetic reconstruction are size of defect, availability of hard and soft tissues in defect area, proximity of vital structures, systemic conditions and, the most important of all, patients' attitude and temperament. This article describes the step by step clinical and laboratory procedure involved in the rehabilitation of a hemimaxillectomy patient using simple hollow obturator prosthesis to improve patient compliance for a more definitive future treatment pian. The installation of an immediate complete denture can maintain both oral function and esthetics for a patient. This report describes the fabrication of an immediate complete maxillary denture using the patients natural teeth. As soon as surgery is compieteci, the patients vertical dimension, tooth position, alignment, occlusion, color and shape are restored. Eyes are vital organs not only for vision but also as an important component of facial expression. Loss of an eye due to trauma or disease resulting in facial defect has a crippling effect on the patient's psychology. The placement of a good artificial prosthesis serves as a great psychological, social, and cosmetic benefit in rehabilitation of the patient. This article discusses prosthetic rehabilitation, in an elderly female patient with a massive orbital defect on the left side of the face, using room temperature vulcanizing silicone material.